Find and delete huge files. Is there a better alternative to File Sumo? 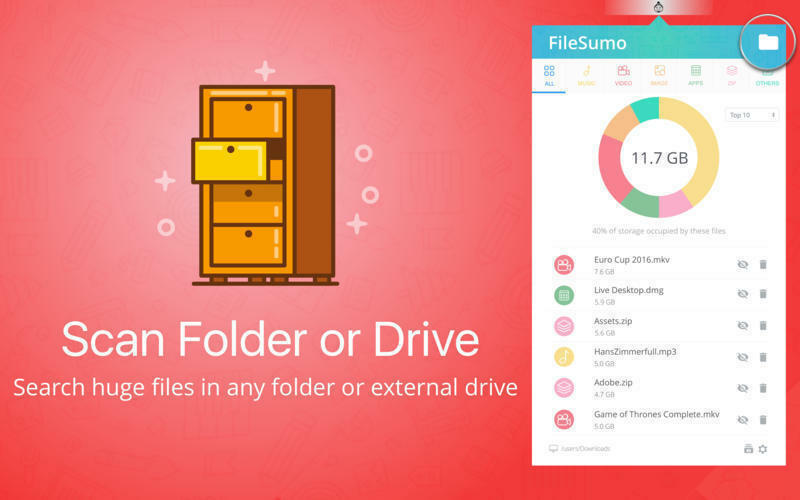 Is File Sumo really the best app in File Management category? Will File Sumo work good on macOS 10.13.4? 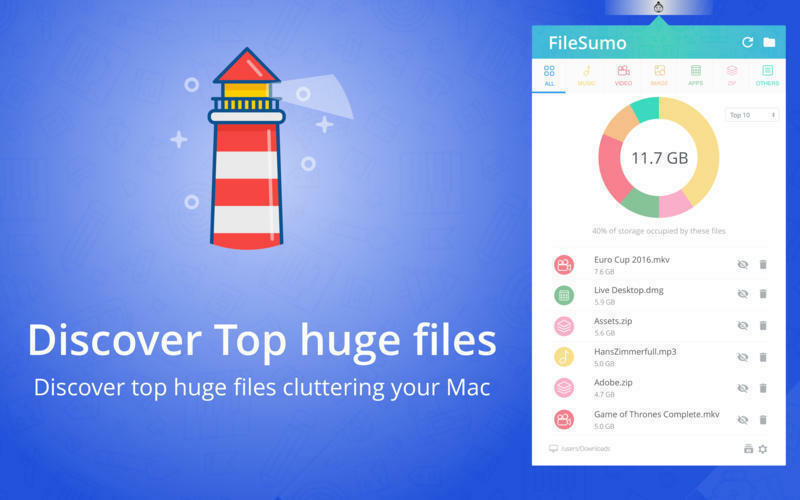 FileSumo is an awesome app to help you discover and clean huge files which are cluttering the disk space in your Mac. 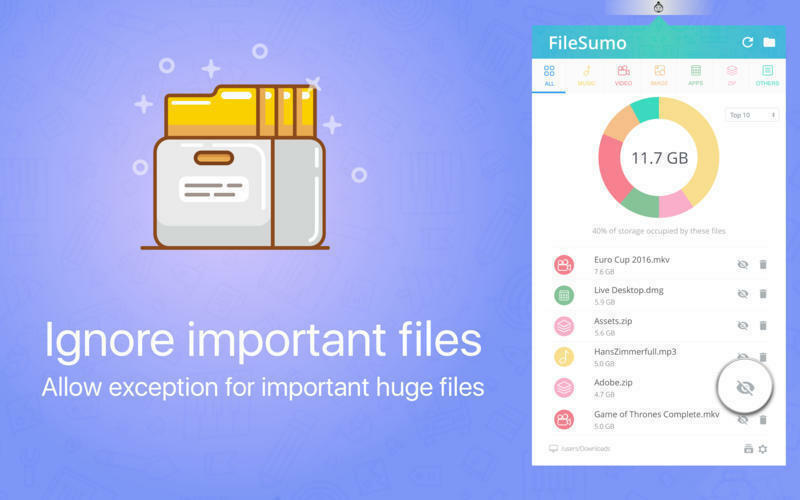 Top 50 Huge Files - FileSumo provides the list of top 50 huge files and their sizes along with the options to view each file in finder, add the file to an exception list or delete the file directly from the app. 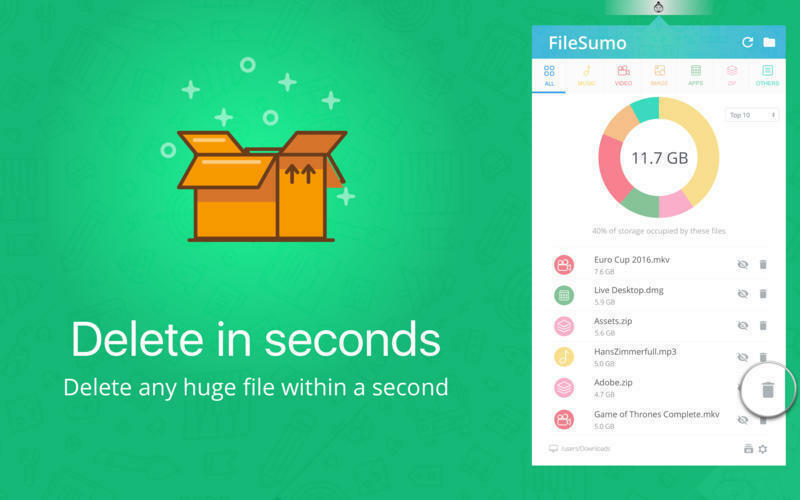 Find Huge Files in Seconds - FileSumo searches for huge files in your Mac within seconds. The app has very finetuned search logics and algorithms to ensure that identify the huge files instantly. Updated app intro screens and flow. File Sumo needs a review. Be the first to review this app and get the discussion started! File Sumo needs a rating. Be the first to rate this app and get the discussion started! 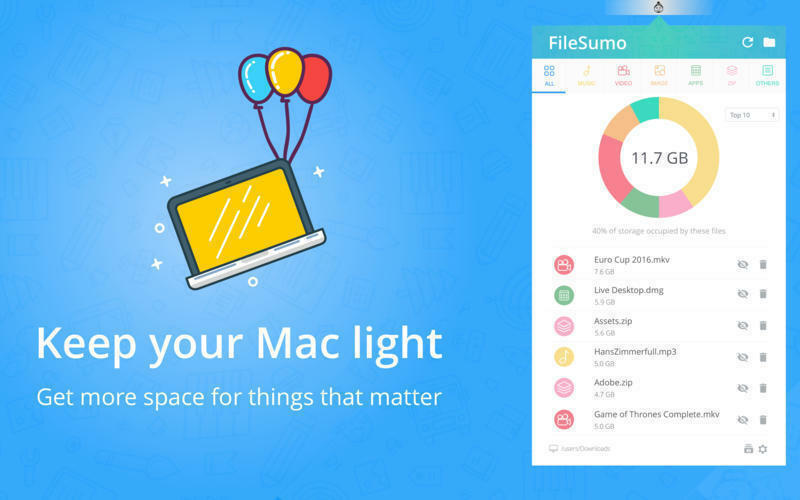 Search Whole Mac or a Specific Folder - FileSumo provides the option to search for top huge files in the whole Mac or within a selected folder. Easily toggle between both the modes in a single click. Exception to Important Files - FileSumo provides an option to ignore a huge file in the top 50 list and add it to a exception list. You can access the exception file list anytime to remove the exception. View in Finder or Instant Delete - FileSumo provides the option to view any huge file in the list in the finder for review or delete the file permanently from within the app itself. Filter Huge Files by Category - The app also provides the ability to easily filter the huge files by type. The current categories available are Music, Video, Image, App, Zip and Others. Launch on Start - You can configure the FileSumo app to launch on start so that the app is launched automatically everytime the system starts is ready in the menubar.